Music Licensing – What Happens When Things Go Wrong? Let’s look at each in turn and the strategies to avoid them. With the sole exception of proven public domain works, if you use music in a brand marketing campaign, you need a licence in both composition and sound recording. Period. There are no ifs or buts. No excuses. Claiming that you didn’t know won’t protect you. Likewise, it’s not sufficient to say you couldn’t find the rights owners. Without a valid licence, you are guilty of copyright infringement. You are breaking the law and complicit in illegal activity, whether or not this was intentional. Yes, I appreciate that seems a bit melodramatic, but it’s highlighted for a reason. I’ve personally witnessed brands and agencies discussing the pros and cons of “trying to get away with it”. Highly educated, intelligent professionals considering the risks of getting caught for intentional theft of intellectual property. Broadly speaking, in the marketing and advertising worlds, copyright infringement is the use of an existing composition and/or sound recording within a campaign without a valid licence. Such usage can infringe copyright controlled by music publishers and/or record labels. Thankfully, most marketers and agencies know not to intentionally dub unlicensed music on a campaign film and hope that no-one will notice. So intentional unlicensed use is less common now than in the past. However, I still see examples of unintentional unlicensed use, usually arising from misunderstandings between brand, multiple agencies and/or multiple music supervisors, all assuming that someone else has secured the necessary licences. In simple terms, the solution to unauthorised usage is to ensure you have licences in place which are fully aligned with your media plan i.e. the usage you need should be accurately reflected in the licence that grants permission for that usage. Breach of licence is slightly less serious than Copyright Infringement in that it assumes you’ve already secured permission for the usage but have gone beyond the agreed restrictions. However, the rights owners, artist and songwriters may still be offended and wish to make a legal claim. I most commonly see these problems when licences are brokered on behalf of a centralised global marketing team, initially responding to requests from their colleagues in local markets. However, the local markets subsequently proceed with new or altered usage without first checking with their global colleagues if that’s covered in the licences. The global marketing team discover the unlicensed usage, demand that their local market colleagues terminate the usage temporarily and negotiate a reasonable retrospective licence fee before allowing the campaign to continue. The global marketing team discover the unlicensed usage, admit the error to the music rights owners and negotiate an expensive though acceptable retrospective licence fee to allow the campaign to continue uninterrupted. The global marketing team discover the unlicensed usage, demand that their local market colleagues terminate the usage immediately and hope that the music rights owners never find out. The global marketing team discover the unlicensed usage; they ignore it and allow it to continue, hoping that the music rights owners never find out. The global marketing team discover the unlicensed usage; they ignore it and allow it to continue. 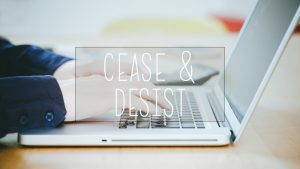 The music rights owners discover it, issue a cease and desist letter, demand the campaign is immediately halted, claim for both a high retrospective licence fee and unreasonably high penalty fee. Of course, the first option is the recommended course of action. Generally, if you “put your hand up” and admit the error, having temporarily halted the campaign, you’ll find that music rights owners will be reasonable in their response. In contrast, if you knowingly allow an unauthorised usage to continue and are then “found out”, expect no mercy from the music rights owners. In summary there’s no excuse for deliberate unlicensed usage by a brand. Brands should expect legal claims and penalty fees for unlicensed use Music Rights Owners can be litigious: they fiercely protect their copyrights. A policy of honesty and transparency is always best and rights owners are usually more lenient to brands who admit their mistakes. It’s wise to suspend an unlicensed campaign then negotiate required usage, but it’s always cheaper to secure a valid licence upfront before usage begins. If you have any questions about copyright infringement or breach of copyright (or anything else to do with music rights) leave a message below or get in touch with me directly.